Paying close attention to something causes your brain to release a variety of chemicals including acetylcholine. These chemicals actually amplify the signals that are sent from one brain cell to another, therefore boosting your brain’s ability to learn and remember. As a result, attention plays a remarkably important role in the brain. However, managing your attention to ensure you are focusing on what is important is only half of the brain’s role. It is equally important that your brain learns to ignore those things that don’t matter. Chaos would reign supreme in your brain if it wasn’t highly selective about what it chose to learn or to remember. If your brain maps recorded everything they saw, felt, heard, thought and did with identical clarity they would be a hopeless, incomprehensible mess. Given how much time you spend sitting down every day just imagine how enormous the representation of your rear end would be in your brain if things were recorded equally! Training the brain to focus its attention on what matters – and ignoring what doesn’t matter – becomes an important component of any brain fitness regimen as a direct result of the relationship between memory and attention. Challenging your brain to focus in on certain information while ignoring competing information is the objective of Mixed Signals. The exercise is to practice this skill by requiring you to listen to a letter, colour, number or other piece of information while seeking out a set of numbers, letters, words, symbols, or other information. You will click the left arrow key on your keyboard if what you hear matches what you see in a specific way. If what you see and hear doesn’t match then you will do nothing. As an example, you might see “iiaii” on screen and be asked to click the left arrow key if what you hear matches the middle letter – in this case “a”. If you hear “i” or some other letter that doesn’t match then you don’t take any action. Training that requires you to control your attention very quickly while the information you see and the information you hear competes is called a “Stroop” task. 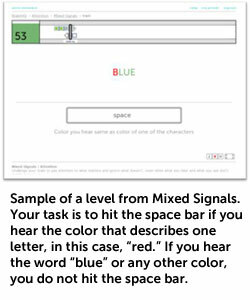 Mixed Signal is designed to use the Stroop task training concept so that even when your brain is distracted by competing information you learn to control your attention very quickly. Feeling sharper in daily life – no matter what you are doing – can be achieved by improving your skill at controlling attention. This will ultimately help you focus on and remember those things that truly matter to you.